The picture above was taken one Memorial Day weekend when the two moves that followed (to Harlem and then back to Brooklyn) were not even a whisper. This first terrace, in the Cobble Hill neighborhood of Brooklyn, a dozen blocks north of where we live now, was a sweet, quiet and private place. There are many things we miss about it, like the top floor sense of isolation, being able to see the sun and moon rise in the east, and the quick access to the roof and its wide, big sky horizons. Measuring those exact 66 square feet, this (lack of) space transformed my life. And the cat you see there, Don Estorbo, had a lot to do with it, too. He started his irascible blog a few months before I did. That gave me the idea to write this one: it will be ten years old, this June. The blog led to many good things. New and lasting friendships, writing for a living, the discovery of the Frenchman, all the way on Canada's British Columbian coast, and my first book. 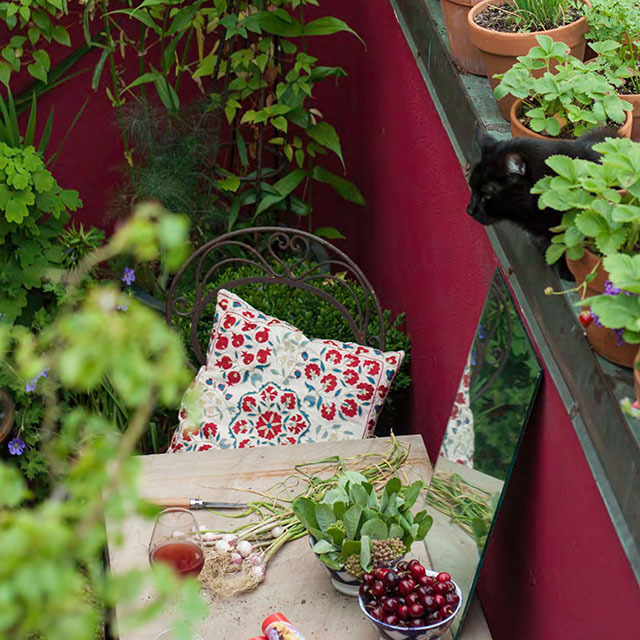 So over on Instagram (@66squarefeet), for this little anniversary, I am giving away two copies of the book that this terrace inspired: 66 Square Feet - A Delicious Life. Please follow that link if you'd like to enter the random draw. The deadline is Wednesday the 31st, 11PM, EST. We now live in Carroll Gardens with about 1,000 square feet of garden - a fantastic luxury in a city like New York. We can move without bumping into things. I can grow more than token crops, at last. Eight rows of potatoes, rather than one pot. I can experiment with the wild plants that I like to forage. And our crazily weathered salvaged oak table, built just for this space, never runs out of surface area, like that little stone table above, which I now use as a potting bench. We have learned things with each move. We have lost. We have gained. I miss aspects of each place we have lived. Just as I was happy to leave elements of each. I will write more about it, one day. Which means next spring I will have been following you for ten years. It's been a fun and sometimes sad voyage (thinking of Storbie ☹️). Happy Anniversary, Marie and I'm looking forward to many more years. Happy Anniversary! Looking forward to the new book. Thank you, Katie. We do, too. More than we should. Poor little Estorbo, I still remember how I cried when you lost that sweet boy. I love your first book and still miss that terrace myself - you inspired me greatly when I was renting during a painful divorce. I went crazy with containers and loved all of it! Now I have a garden again and my very own home, but still use a lot of containers...I even have black and red currants, and raspberries, in big containers on my patio! Looking forward to the new book....and I wish you would come do a foraging walk in the Catskills! So glad you have your own space, now, Debbie! It would be fun to do a foraging walk in the Catskills. Maybe when there is more time I can team up with an inn or restaurant out there. Isn't it high time to get another cat? We are not allowed to have a cat. I've been following your blog for five years now, from the beginning of my journey as a container gardener. You have been such an inspiration and made me strive to become a better gardener. Like you, I've got more room to play with now and definitely got much more adventurous with the type of plants I grow. Missing Estorbo. I had always look forward to a good chuckle over at his blog. I started reading your blog when you indeed had that tiny patio. Through the years, I've loved watching how you live to the fullest with what little you had space wise. I got out of gardening for a couple of years due to a skin problem but I'm back and the first website I looked up was yours. I really enjoy reading about what you are doing. I'm the total opposite. We are on 88 acres of ranch land. We have a 60' hydroponic greenhouse we grow a variety of things in. Summer is when we basically shut things down to rest our gardens, concentrate on our flower garden, and enjoy not working so hard. My hubby grows most of what we eat. We have 2 keyhole gardens, several raised beds and a lot galvanized tubs all growing my desires. We concentrate on unusual things. We also have chickens so any failures we have, are bounty for them. I just wish we got the cool nights you get then we could grow beautiful produce like you. Ours are stunted in the heat. I think that's why we garden September-May. Thank you for your comment, Hilary. And 88 acres! Adopt me! I am so glad you are able to garden again. You sounds as though you have a lot going on. Our nights are only cool in spring and fall, though, summer is (usually, you never know) hot and horribly muggy. What are your winter temps like? Can you grow cool season crops, then? You are not on Instagram, are you? Your ranch set up sounds very Instagrammable. I seem to follow so many growers and small farmers, there. We grow everything imaginable in the fall,winter,spring. I try to focus on unusual and rare heirlooms. We love the variety of Asian greens. Different broccoli and cabbages. I'm big on baby bok choy and all the butter lettuces, mache, leafy heads etc. I eat 80% veggie and little meat. love all the root crops. Our winters are pretty mild. When we get a cold snap we have covers for our produce. Also we hang heat lamps if the weather gets below 15. Very unusual. I don't use Instagram. I didn't grow up w/ social media so I don't think about it. I'm busy putzing in the garden. If you are ever in Texas you are welcome to come visit. We never meet strangers around here. Thank you for your wonderful blog, which inspires me in many different ways and on several different levels. Although I missed your years with Don Estorbo, I read your references to him as soon as I subscribed and so went into your archives and read every post I could find that mentioned him. What a magnificent creature he was, never to be forgotten.